“Supported by an orchestra in peak shape and stocked with first-rate vocal talent… not only enchanted, but also made clear to out-of-towners that when it comes to thinking outside the symphonic box, the Cleveland Orchestra is fully engaged. Other concerts that weekend only reinforced the message. Unfazed by the notoriously complex Daphne, the orchestra and Welser-Möst Thursday and Friday went on to deliver several more rarities, including Dvořák’s Symphony No. 5, Messiaen’s Chronochromie andHymne, and Strauss’ own Symphonia Domestica. 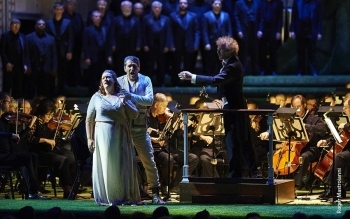 Photo: Soprano Regine Hangler (as Daphne) and tenor Andreas Schager (as Apollo) performing in Richard Strauss’s Daphne with The Cleveland Orchestra at Severance Hall, Franz Welser-Möst conducting, in May 2015. Photo by Roger Mastroianni.